The Sundarban in India epitomises one of the largest remaining trails of riverine mangrove forests, situated at the mouth of the Ganges, before the river disperses into the Bay of Bengal. The forests are territorially shared between the two countries of India and Bangladesh, with Bangladesh occupying the larger faction. Sundarban is the largest remaining tract of the Royal Bengal Tiger, a predator who necessarily occupies an integral core of the terrestrial food-chain and is known for its valour in man-eating trait. The eminence of the tiger coupled with a range of exotic mangrove and aquatic resources have acquired the region a status of the ‘reserved forest’ in 1878, along with other landmark provisions of conservation which followed in the aftermath: Tiger Reserve, National Park, Critical Tiger Habitat and Biosphere Reserve. Sundarban Biosphere Reserve (SBR) occupies the entire stretch of the inhabited and forested islands of Sundarban in India with an area of 9630km². The forest cover constitutes 4263 km² while the human inhabited area measures 5367km². The settled area of the biosphere reserve lies outside the forest area, being divided into 19 community development blocks under the districts of North and South 24 Parganas in the state of West Bengal. Sundarban Tiger Reserve (STR), which was notified in the year 1973 under Project Tiger scheme of the government of India[i], falls within SBR and has an area of about 2584.89 km² out of which 1699.62 km² is being designated as a Core area or the Critical Tiger Habitat (CTH). Sundarban National Park has been declared as a World Heritage Site (presently known as World Heritage Property) in 1987 by the UNESCO and falls within this CTH covering an area of 1330.12 km². The Core area of the STR overlaps with the core area of the SBR and is considered as the CTH. However, the immense ecological importance of the region and the ensuing efforts ascribed towards conservation of the forests and its wildlife are relatively new, following the independence of the country from British imperialism in 1947. The idea of forests as useful, and as something that merits conservation did not strike the imperialists in the 18th and the early 19th century when Sundarban, as in the writings of Hunter (1875), was depicted as a ‘drowned island’, ‘impenetrable forests’ and ‘thick brushwood’, without any restrictions on subsistence based activities like fishing, honey collection, fuel-wood collection etc. 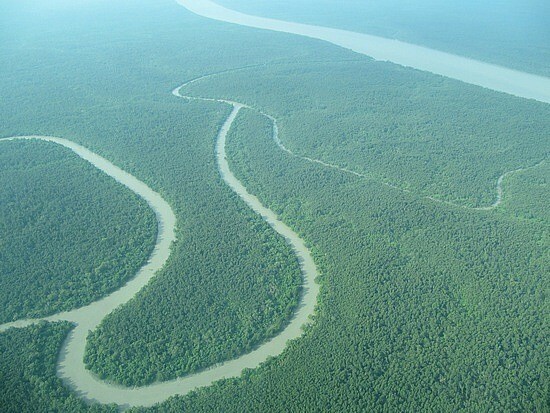 The instinct of revenue generation from the vast forested tracts of Sundarban through rapid reclamation was first espoused by Claude Russell, the collector general of the district of 24 Parganas, who divided Sundarban into respective plots and leased them out to the landlords for timber extraction and collection of revenue (Ghosh, Schmidt, Fickert and Nusser 2015). The clearing operation started in 1781 under the magistrate of Jessore district in Bangladesh known as Tillman Henkel, who brought migrants from Midnapore (Medinipore) and other parts of central Bengal, primarily tribals, to clear the vast tracts of forest lands. Landless indentured labourers migrated from places like Chotonagpur plateau, Balasore and Arakan coast in Myanmar many of whom settled there after reclaiming the lands. Tigers were treated to be a major threat for land reclamation, since it was estimated by the second half of the 19th century that tigers killed about 1600 people every year (Chakrabarty 2009: 81). It was only during the 1870s, that the government, out of a sense of extensive forest depletion, had a realization that such uncontrolled felling need to be checked. The passing of the Forest Act of 1878 reconfirmed the fact that the forest is a property of the government, but however included the category of ‘reserved’ or ‘protected’ forests within the forest conservation laws. This was followed by stringent methods of conservation and rapid curtailment of bonafide livelihood rights. The land of river and forests. Traditional wooden boats used for forest work (source: fieldvisit). The cultural norms of the region are embedded in a range of religious mores and social practices, noted among which is the worship of Bonbibi, a forest goddess who is believed to protect the forest workers from the potential risks of tiger attack. According to the Islamic religious text Bonbibi Johuranama, Bonbibi saved a poor boy called Dukhe from the wrath of Dakshin Ray, who was a clairvoyant and through his mythical powers, was able to assume different forms, primarily that of a tiger. While the fear of Dakshin Ray loomed large within the poor and landless forest workers, Bonbibi and her brother Shah Janguli turned out to be their rescuers, by fighting against the tiger demon and finally winning the battle. A mutual agreement was made thereby that Dakshin Ray would never feed on the forest workers who enter the forests for meagre livelihood needs. However if someone tries to be voracious and exploits the forest resources beyond need, then he/she would suffer the fate of his/her actions by falling prey to Dakshin Ray. Reverence towards the forest through such traditional beliefs and practices are practically translated into a set of rules and sustainable norms of extraction, while entering the realm of the forest and using the resources. However, the customary practices of the communities have been severely curtailed by the Forest Department by closing off bulk of the forests as core areas, where entry is considered to be illegal, dealt with verbal and physical abuse and are frowned upon by the department functionaries. The buffer area of the STR, which measures only 522.85km² is severely stressed by anthropogenic pressures and constrained of resources due to unabated exploitation, making the population fall back upon the restricted forests. The traditional techniques of subsistence based livelihoods as practiced by the forest workers are not always incompatible with the scientific techniques of conservation, as is often assumed. The population relies on a set of traditional ecological methods which combines reverence with sustainable extraction. The Forest Department, however, averts the cultural norms as well as the possibility of a dialogue between the customary and the statist methods of conservation. 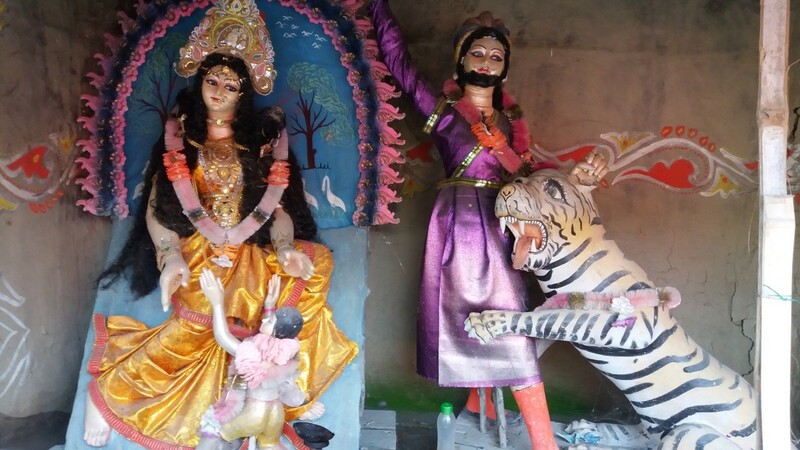 The picture represents forest goddess Bonbibi (left) and her brother Shah Janguli (right), who are widely worshipped in Sundarban by the forest workers, as supernatural deities, protecting them from the tiger demon Dakshin Ray (the tiger). [iv] (Source: field visit). Whether one enters the core area out of greed or out of resource scarcity in the buffer is disputed, considering the disproportionate number of licensed as well as unlicensed boats which venture the forests of STR. The Forest Department runs only 923 Boat Licence Certificates as of now, out of which only 650 are operational, grossly underlying the actual need of licenses by the present number of fishers. Most of the forest fishers thus venture without licences which cordons eligibility for compensation to their families in cases of casualty by tiger attack. The large number of deaths which occur every year in the core areas are not only unrecognized, but are also refused by the officials of the Forest Department in most cases. Whether deaths happen in the core or in the buffer, compensation is an implausible reality for the forest worker, since very few speaks of getting one. A fisherwoman notes that in February, his husband was killed and taken away by a tiger near an area known as Gopalkhali, which is in the buffer area. While his fellow fishermen reported the incident to the Forest Department as well as to Choto Mollakhali Police Station, police refused to believe the accident. They did not even record the ‘missing diary’ of her husband. Forest workers say that the police station does not report incidences of accidents without the approval of the Forest Department. Thus she did not receive any compensation, in spite of the accident taking place in the buffer. The tribal hamlet at Tipligheri village in Lahiripur houses around 200 tribal households, most of who are landless and are forest workers. People say that the number of casualties of tiger, crocodile and river shark attacks are so many that the villagers themselves have stopped keeping any records of deaths. None of the tiger widows[v] receive any widow pension, as is entitled to them by the state. According to another forest worker, the compensation amount of Rs 25000 to be given to his family on account of his father’s death by a tiger was appropriated mostly by the local political party which included the political patrons of the Forest Department. At the end, he received only Rs 7000. The forest workers collectively believe that the deaths occurring in the core areas are not reported in many cases, fearing severe fines and abuse. Such deaths cannot even be bewailed in the villages and the victims are thought to be better abandoned to the tiger without any effort to fight it back, in the fear of the abuse by patrolling forest guards. These guards, in case of spotting a fishing boat in a core area, are exceptionally abusive and if they come to know about an accident[vi] in those areas, the abuse comes down heavily on the other members of the team, regardless of whether the victim has survived or not. Even in the village where the victim resided, mourning has to be very reticent, not to let know any outside members about the incident. Claiming compensation in such cases is even unthinkable. In a reserve which has assumed increasing eminence due to its exotic range of flora and wildlife and has been extensively invested by national and international donors, the little promenades of human spaces seem to be invisible! The range of literary activities which prescribe the imminence of the nature-culture relationship have once again been rendered derelict through the fervent exploitation of forest based livelihoods and the denial of cultural associations with the forests. Traditional ecological reverence like the worship of Bonbibi might not have transcended local barriers of the lower islands in Sundarban to reach the domains of the popular cultural and religious practices in the cities, but it is still idiosyncratic and preaches virtues of conserving the nature in a just way. The repertoire of discourses which pre-empt human intrusion in the forests inhabited by the ‘tigers’, need to look back into the regional history of shared experiences in Sundarban, where people once lived and evoked understandings of practical settlements alongside the forest. The dense mangrove forests of Sundarban interspersed with rivers. Bhattacharyya, S. (2016). Ma Bonbibi, mother to humans and tigers. Pari. Available at https://ruralindiaonline.org/articles/ma-bonbibi-mother-to-humans-and-tigers. [Accessed on 25th March, 2017]. Chakrabarti, R. (2009). Prioritizing the Tiger: A History of Human Tiger Conflicts in the Sundarban. Current Conservation, 4 (4), pp. 44-47. Chacraverti, S. (2014). 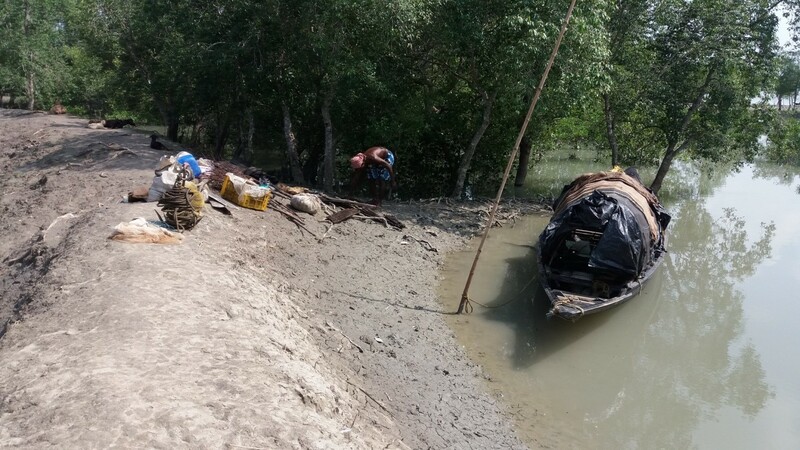 The Sundarbans fishers: coping in an overly stressed mangrove estuary. Chennai: International Collective in Support of Fishworkers (ICSF). Ghosh, A., Schmidt, S., Fickert, T., & Nusser, M. (2015). The Indian Sundarban Mangrove Forests: History, Utilization, Conservation Strategies and Local Perception. Diversity, 7 (2), pp. 149-169. Hunter, W.W. (1875). A statistical account of Bengal: district of the 24 Parganas and Sundarbans. London: Trubner & co.
[i] The Project Tiger was implemented in the year 1973 under National Tiger Conservation Authority (NCTA), by the Ministry of Environment, Forests and Climate Change, to implement state level conservation emphasis on the preservation of tigers. Under this scheme, the Government of West Bengal on 18.12.2007, constituted Sundarban as a CTH, listing the area to be 1699.62 km² which was previously 1330.12 km². Under this notification, a large area of the STR, which was previously buffer, was also included within the core, increasing the area of the inviolate zone. [ii] Lower delta signifies those settled areas of SBR, which shares close proximity with the forest. In the lower delta, tidal action makes and remakes the physical topography, since these settlements are prone to river erosion and flooding. These areas are away from the cities, in contrast to the upper delta, which has a stable land surface and are less prone to the threats of erosion and submergence. [iii] The term ‘forest workers’ is used to denote the collectivity of people who ‘work’ in the forests to sustain their livelihood. Working in the forest implies fishing, honey collection, crab fishing, prawn seed collection etc; occupations which are integrally dependent on the forests and the river creeks. These people spend multiple days in the forest areas which are interspersed by the innumerable river creeks. Their mode of communication is simple wooden boats, driven by oars and radars. [iv] Refer to https://ruralindiaonline.org/articles/ma-bonbibi-mother-to-humans-and-tigers/ for more details. Also Forest of Tigers: People, Politics and Environment in the Sundarbans (2010) by Annu Jalais give an anthropological account of Bonbibi and her worship in Sundarban. [v] Tiger widows are women whose husbands were killed by the tigers. A forest fringe village like Patharpara usually has several tiger widows. [vi] Instances of death by tiger attacks are locally known as accidents in the village.